NASA astronaut Michael Hopkins, Expedition 37/38 flight engineer, awaits the start of a spacewalk training session in the waters of the Neutral Buoyancy Laboratory (NBL) near NASA's Johnson Space Center. Hopkins is wearing a training version of his Extravehicular Mobility Unit (EMU) spacesuit. Hello, Space Fans! 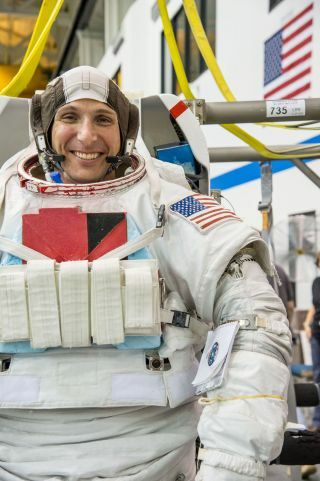 NASA astronaut Mike Hopkins is counting down to launch to the International Space Station on Sept. 25, and SPACE.com will chat about his upcoming departure from planet Earth on Monday, Sept. 9, and we wanted to know what would YOU ask Mike, if you could? Let us know in the comments section below. Email Tariq Malik at tmalik@space.com or follow him @tariqjmalikand Google+. Follow us @Spacedotcom, Facebookand Google+.